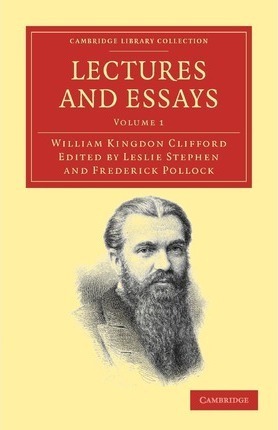 A fellow of Trinity College, Cambridge, and of the Royal Society, William Clifford (1845-79) made his reputation in applied mathematics, but his interests ranged far more widely, encompassing ethics, evolution, metaphysics and philosophy of mind. This posthumously collected two-volume work, first published in 1879, bears witness to the dexterity and eclecticism of this Victorian thinker, whose commitment to the most abstract principles of mathematics and the most concrete details of human experience resulted in vivid and often unexpected arguments. Volume 1 includes a detailed biographical introduction by Clifford's colleague, Frederick Pollock, who situates his close friend's interests in Darwin and Spinoza within a larger, life-long devotion to the principles of scientific enquiry and experiment. This volume also features two important essays, 'On Some of the Conditions of Mental Development', his first public lecture delivered at the Royal Institute in London, and 'The Philosophy of the Pure Sciences'. Introduction: 1. Biographical; 2. Selections from letters, etc. ; 3. Bibliographical; Lectures and Essays: 1. On some of the conditions of mental development; 2. On theories of the physical forces; 3. On the aims and instruments of scientific thought; 4. Atoms; 5. The first and last catastrophe; 6. The unseen universe; 7. The philosophy of the pure sciences.